Since childhood, we often go to Manila almost every week since the Malls in Cavite are not yet even planned. One of our usual spots is at Binondo where the Chinatown is located. My grandfather is Chinese so he always insists on taking the family to the streets of Chinatown where tons of Chinese Foods, Chinese Medicines, Chinese Groceries, Chinese Gold and lots and lots more of Chinese stuffs! 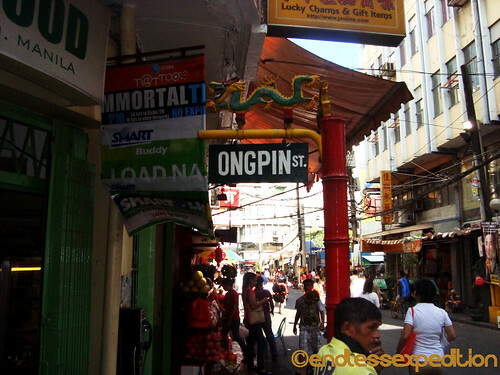 Since Childhood, we got used to calling Chinatown, Ongpin, which is the busiest and most famous street which is named after Don Roman Ongpin, a chinese mestizo that owned an Art-Supply Shop that catered to famous Filipino painters such as Juan Luna, Felix Hidalgo and even our National Artist Fernando Amorsolo. A number of food items are very popular along the streets of Binondo. Some of these are the Hopia or small cakes with Mongo Fillings of different flavors from the traditional Ube, Pandan, Cheese up to Eng Bee Tin's new Concoctions Chocolate, Moccaccino, Pastillas and many more. Another famous item that you can buy on the streets of Ongpin is the Tikoy. Tikoy is a glutinous rice cake made of rice flour, sugar and other special ingredients which can be eaten raw, grilled or the most popular to the Pinoys wherein the Tikoy is cut into strips and dipped into eggs then deep fried until golden brown. 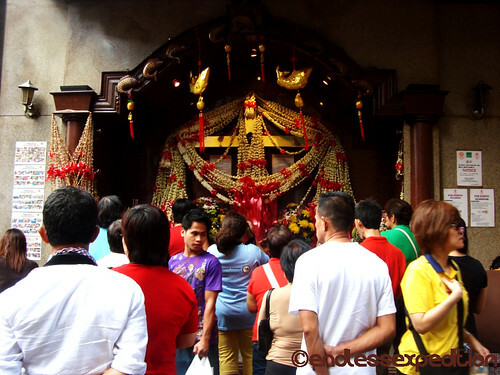 As few people know, a large quantity of Chinese-Filipinos are Catholic Christians but even so, they preserve their rich cultures and traditions as to worship. They light these incense sticks to give respect, pray and offer thanksgiving to our Lord, the same incense sticks used to venerate their Buddhist gods. We also use these incense sticks in paying our respect to the deceased loved ones. Also, the hanging of the Sampaguitas is never withdrawn, which is a Filipino tradition to any festive activities. 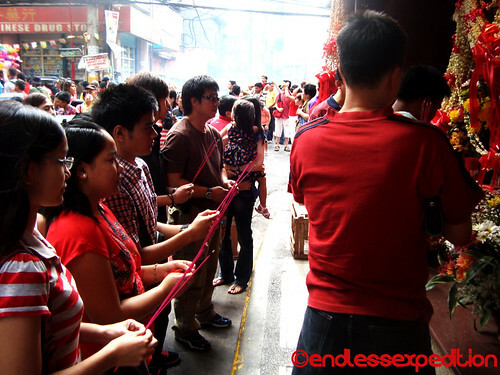 During the Chinese New Year, the Streets of Binondo are filled up with people wearing their brightest red to welcome the New Year with Joy, Happiness and Good Luck. It was truly a Joyful moment for me when I got there durnig the Chinese New Year with my friends for the very first time. Surely an experience I would not doubt on recreating this coming Chinese New Years. With it, I will be leaving you all with my wishes for a Prosperous New Year to everyone around the World and never ending Blessings from our Lord and Saviour Jesus Christ.